Discover a treasure trove of natural and cultural wonders in Ecuador, straddling the equator on South America's Pacific coast. Discover a treasure trove of natural and cultural wonders in Ecuador, straddling the equator on South America's Pacific coast. Immerse yourself in its soaring capital city and stroll along the cobblestone plazas. Wander through nature’s playground in the rainforest at Mashpi. Stay awhile to meet Andean villagers in markets and workshops, and delight in the traditional life of a hacienda. There’s a whole world to explore in these Andean peaks. Touchdown in Quito, the second highest capital in the world at 2,850 metres, after La Paz Bolivia, and one of the most endearing. Receive your A&K welcome and enjoy a private transfer to your boutique accommodation in the historic centre. After time to relax and refresh, take a short private visit to nearby Carmen Alto cloister, which dates to the 17th century. Spend time with the Carmelite nuns who still live there and sample their traditional sweet treats before returning to the hotel. Delve deeper into Ecuador’s captivating capital and learn first-hand how it earned its status as one of the first UNESCO World Heritage sites. Meander through colonial streets and cobblestone plazas amongst flowering balconies and intricate woodcarvings. Linger in the San Francisco Church, the bustling Independence Plaza and La Compañía, where seven tonnes of gilded shimmering walls will take your breath away. Spend the afternoon at leisure. Head to the hotel’s terrace and enjoy a drink as you soak up the views across San Francisco square. Explore more of the city brimming with friendly locals, hearty foods, colonial architecture. Day 3: Quito – Mashpi Reserve. A private journey north to the Equator at the Mitad del Mundo (Middle of the World) and experience the bizarre sensation of standing in both hemispheres at once. Spend some time learning about the unique astrology and science of the Equator in the Intiñan Museum. Continue over the pass towards the Pacific Ocean and arrive at Mashpi Rainforest Biodiversity Reserve, one of the world’s most important biodiversity hot spots, home to thousands of plant species and more than 500 species of bird. Be hypnotised by the lively flying machines at Hummingbird Viewpoint before arriving at your luxury hideaway. Following lunch, meet your expedition leader and discuss the menu of unique eco-adventures led by expert naturalist and local community guides. Pedal over gorges and treetops on a sky bike. Meander through forest trails. Or take a dip in the nearby waterfalls. Don’t miss the opportunity to explore the wilderness by night on a guided walk. Discover, experience and cherish the wonders of Mashpi. Rise early to hear the choir of birds welcome the day. Venture into the forest and navigate trails of wondrous wildlife, with ferns towering above and a carpet of mushrooms underfoot. Seek out waterfalls and wade through refreshing rivers, all while learning the secrets of the forest. Visit the Life Centre to discover more about your surroundings, or simply laze in a hammock with a cup of locally-grown java, mesmerised by the vivid butterflies and birds. Climb the observation tower for a birds-eye vista. Day 5: Mashpi Reserve – Otavalo. Enjoy a final activity this morning before leaving this secret wonderland and heading north into the dizzying heights of the Andes, to a family-run hacienda and your home for the next two nights. Hear stories of this 1600-hectare farm, which has been in the family of the late Galo Plaza Lasso, a former president of Ecuador, for more than 100 years. Then, seek out your favourite spot for a glass of wine before dinner. Rise early to glimpse rare species of birds on a gentle walk around the property. Enjoy a morning filled with talent and artistry in the small mountain village of Peguche. Step inside a music-filled home where your talented hosts craft and play traditional instruments, then learn the ancient art of weaving. Take a hike to the town’s sacred waterfall before a well-earned lunch made from organic garden produce. Later explore the wonders around your hacienda, which includes a cheese factory, organic garden and trout farm. Visit the Galo Plaza Lasso Foundation, which has set up a wild condor rehabilitation project on the estate, and even try your hand at milking a cow. Day 7: Otavalo – Cotopaxi National Park. Depart for the bustling small town of Otavalo. Meet the friendly Otavaleños and discover strange-looking produce at the world-famous market (Saturday only) that’s been gathering since pre-Incan times. Enter a world of delicate colour in the rose plantation of Hacienda La Compañía which originally belonged to the Jesuit order and is now home to one of UNICEF’s Flowers for Kids educational initiatives where you will enjoy a delicious local lunch. Continue your journey south along the aptly-named Avenue of Volcanoes to Cotopaxi, the highest of Ecuador’s volcanoes at almost 6,000m. Arrive at your historic hacienda for an unforgettable stay. Day 8: Cotopaxi National Park. Spend time today in the park on a gentle walk to the beautiful Laguna Limpiopungo, at the base of Volcán Rumiñahui, home to local and migrating waterfowl. Return to the hacienda and enjoy the afternoon at leisure soaking up the splendid views of the perfectly cone-shaped Cotopaxi. For the more active, head out on a horse ride, explore by mountain bike or visit nearby rose plantations. Day 9: Cotopaxi National Park – Riobamba. Journey this morning along the mountainous spine dotted with villages and farms to the Andean crater lake of Laguna Quilotoa. Visit the nearby villages of Tigua and Pujili and browse artisan crafts. Continue to Riobamba, once the capital of Ecuador and now a vibrant town brimming with colonial treasures. Meander through the old town, enjoy religious art in the Concepción Convent and expand your knowledge in the Natural Science Museum. Day 10: Riobamba – Alausí – Cuenca. Rise early for the iconic rail journey down the Devil’s Nose, an incredible feat of engineering. Head first to the city of Alausí to board your train. Drink in the Andean peaks from your carriage as you climb up the cliffs. Then, descend the Devil’s Nose, a series of switchbacks designed to let the train traverse a 45-degree rock slope. Stop awhile to explore the charming museum, before riding back to Alausí. Following a simple lunch at a local restaurant, head to the complex Inca ruins of Ingapirca, a place of extraordinary historical significance and a site that was originally used as a political and religious centre. Later continue your adventure to historic Cuenca, a UNESCO World Heritage site and your boutique colonial hotel. Immerse yourself in the “Athens of the Andes” and discover why it’s hailed the hidden treasure of Ecuador and considered the most beautiful city in the country. Meander along cobblestone streets and through flowery plazas to the striking cathedral with three blue domes. Be sure to peek inside at the jaw-dropping gold altar. Later, enjoy the quirky Homero Ortega Panama Hat factory before swapping the city charm for the creative villages of Santa Ana Valley. Meet the guitar-makers of San Bartolomé, visit jewellery workshops in Chordeleg and seek out gems in the colourful markets of Gualaceo. 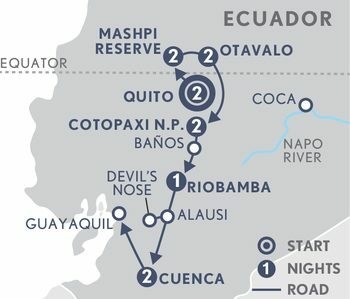 Day 12: Cuenca - Guayaquil. Begin the day with a private journey over the continental divide to the El Cajas National Park, a UNESCO-protected site on Cuenca’s doorstep. Take some time to explore the park, with its rolling lakelands, ancient woods and sprawling cloud forest set against a jagged skyline of rocky peaks. Continue to Guayaquil, the nation’s principle port and gateway to the Galapagos Islands. End your journey here or continue to the Galapagos Islands.